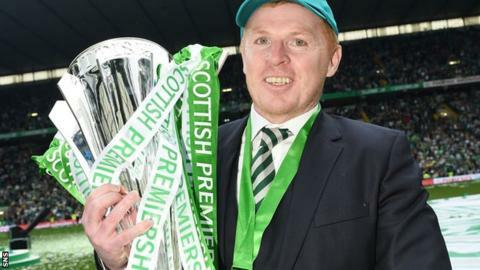 Celtic manager Neil Lennon hopes to bolster his Premiership-winning squad this summer to boost their bid to make an impact in the Champions League. Virgil van Dijk and Fraser Forster have been two of Celtic's stand-out performers this season and have been linked with moves away from the club. But Lennon is hoping to hang on to his star names and bring in some new faces. "We've got some good players here, ideally you want to build on that now and add to it," he said. "At the end of the day, the Champions League is where we really want to be and the experience they've had this season will stand them in good stead going forward. "I'll probably sit down with Peter [Lawwell, chief executive] and John [Park, scout] in the middle of next week and start really planning things and looking at options we have." Lennon's side received the top-flight trophy on Sunday after a 3-1 win over Dundee United on the last day of the season. The result took Celtic on to 99 points for the campaign, they broke through the 100 league goals mark, and it ensured they finished the season unbeaten at home in the Premiership. "To finish off the season with a win is everything I could have asked for from the day," added Lennon. "The players have been brilliant and it's all about them and the supporters today. I said to the players, 'Enjoy it because it goes very very quickly'. "As soon as the Champions League group stage was finished, we felt we'd be more consistent in the league and that turned out to be the case." Anthony Stokes hit the opener against United, with Georgios Samaras adding a penalty and Kris Commons completing the scoring after a Filip Twardzik own goal. Commons, who won the PFA Scotland player of the year and will also be named the PFA football writers' player of the year, admitted he is already excited about next term. "Hopefully, in pre-season, we'll be fitter, stronger and more determined to make things happen next year. "I just can't wait for next year to start and crack on with the Champions League qualifiers."